Fluoroelastomer adhesives and sealants used to protect "microearthquake" detection tools. The GeoEngineering Group of Los Alamos National Laboratory has been successfully using fluoroelastomer-based sealants and coatings to protect seismic measuring instruments from the effects of high temperatures and corrosive elements deep below the earth's surface. The sensitive mapping of seismic activity is being conducted at a borehole at The Geysers, a geothermal field in Northern California. The reservoirs of The Geysers, some as deep as 9,800 feet below the earth's surface, generate natural steam, which is piped to electricity-generating plants. Research has shown that seismic activity is useful in identifying fractures, which are believed to affect the production of geothermal fluids and steam. The results of the Los Alamos project show that borehole instruments are two to three times more sensitive in detecting "microearthquakes" than surface instruments. The Los Alamos GeoEngineering Group has been measuring small, almost undetectable "micro-seismic" activity arising from minute displacements along fracture or fault surfaces. Its subsurface research with a vertical array of six high-temperature geophone sensors detects many seismic events which surface instruments would not hear because of surface noise and greater distance. The array also discriminates among waveforms and locates fractures much more effectively. The sensitive geophone instrumentation, however, would not readily withstand high subsurface temperatures and corrosive forces in the geothermal well for long periods of time. Recognizing this, Los Alamos, in cooperation with Petroleum Geo-Services (PGS), designed, developed and installed a permanent, high-temperature resistant array using DuPont Dow Elastomer's Viton™ fluoroelastomer-based products from Pelseal Technologies, LLC as a protective sealant and adhesive. Although the borehole is cooling over time, temperatures still hover at about 260° F. When the array was first lowered in April 1998, a capability of withstanding temperatures of 310° F was required. Resistance to corrosive forces, such as hydrogen sulfide (which is indigenous to geothermal fields), was also an issue. Still another consideration was the cement, which was used to install the array initially. The PH of cement is a relatively high 13. The solution was to encapsulate the three-axis geophone cradle in an aluminum "clamshell," which was then enclosed in a temperature resistant, watertight seal. For this seal, PGS selected Pelseal® 2077, a one-part black sealant/caulk that is self-leveling and supplied in resealable caulking cartridges. The company also employed PLV 2050, a black two-part adhesive/coating, as a seal on all metal-to-metal seal surfaces on the clamshell. A cable of 20 twisted pairs of PTFE-insulated copper wire ran from the surface to the geophones, which were 100 feet apart. Three twisted pairs went inside each geophone while the others passed across the outside of the clamshell to the next geophone. The fluoroelastomer products proved to exhibit excellent adhesion to the clam shell, the PDVF jacket over the geophone cable and the Teflon® FEP insulation for the array's wires. One concern was that the cable's 0.020-inch thickness would not be strong and thick enough to prevent the jacket from kinking and tearing at the clamshell ends. To protect the cable where it feeds into the clamshell jacket, PGS beefed it up with a thick layer of Pelseal 2077, which was covered with Kynar® shrink tube. This layer also served to make the outer diameter of the cable more concentric, creating a more uniform surface to seal against the ends. Inside the clamshell, as the insulated wires feed into the geophone cradle, soldered connections were a potential weak spot because of the danger of shorting. 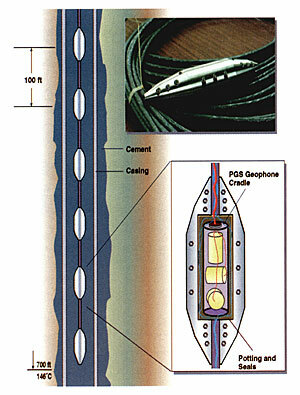 To prevent such shorting, a coating of Pelseal 2050 adhesive was put over each of the soldered wire connections to the cradle, with Kynar shrink tubing over the adhesive. Pelseal 2077 was then used as a sealant at either end of the shrink tubing. All spaces inside the clamshell were then sealed with silicone sealant. The six-level, three-axis vertical borehole array has recorded microearthquakes with frequency content up to 500 Hz at an average rate of 40 events per day. Teflon® is a registered trademark of E.I. DuPont Co.